A few months ago I published my Oscars dashboard (http://bihappyblog.com/2014/03/10/oscars-dashboard/). Recently, I decided to produce a new version of it, leveraging Tableau, and extending it with some additional features possible with some html5 integration. Embedding Tableau in an external web application framework is a great way to leverage Tableau terrific data exploration features like drilling, grouping and filtering with some intuitive, simple to understand and use interface suitable for a user’s portal or an executive audience. 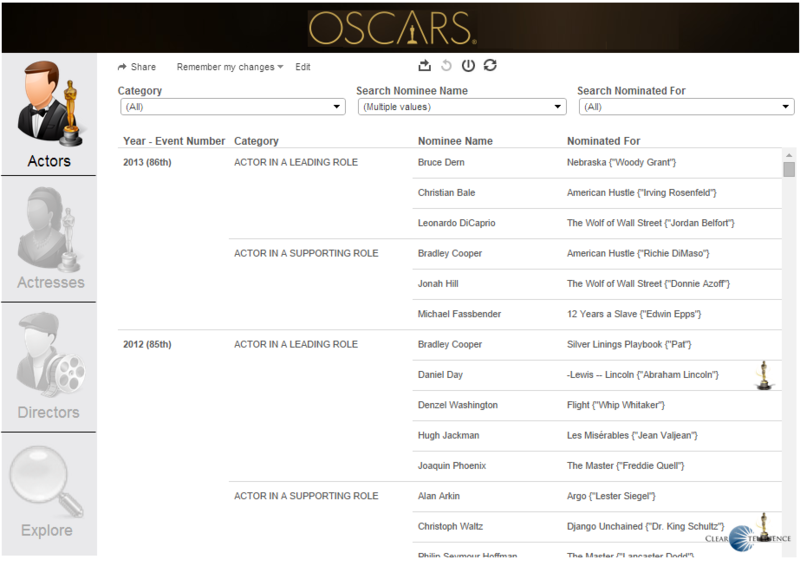 This example leverages my Oscars database file and allows exploration of Oscar nominated actors, actresses, directors as well as a free form exploration option for perusing more of the data set. Click the image above to interact with the full version. Enjoy.. This entry was posted in Data visualization, HTML5, Tableau and tagged Embedded tableau dashboard. Bookmark the permalink.